This blue vase is approximately 260mm (10 & 1/5") tall. 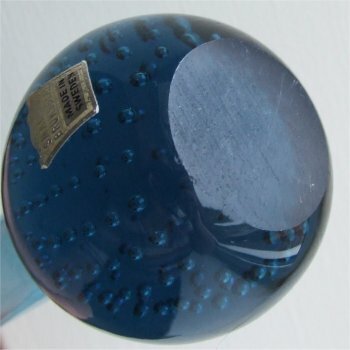 It has medium sized bubbles which come up vertically from the base. The bottom of the base has been ground flat but is unpolished. 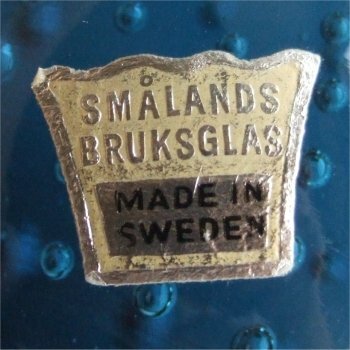 The stem is the same colour as the base and has a wide flare of approximately 45mm (1 & 7/10ths) The crown shaped label is a metallic gold with gold and black writing which states "SMÅLANDS BRUKSGLAS MADE IN SWEDEN" (See images below).